There's a World Sportsball Cup happening soon and for a month or so. I know, I know: they kept that quiet, eh? But there it is, happening away, and this means across the land offices are indulging in the time honoured tradition of the Major Sporting Event Sweepstake. I don't care for football much, but I love a good sweepstake. I think it's partly my genes, and also that one of my favourite books starts with typists making up the slips for one. Anyway, despite my love of the form, I was too slow off the mark at work to contribute my shilling and draw a team. And some people work alone, or in small teams, or in teams that don't like each other, or whatever, and similarly haven't a chance to enjoy the fun. So I've set up an Utterly Pointless 100% Prize Free Twitter Sweepstake (we're calling it the #pointlesstwittersweepstake) so that 31 lucky other people can enjoy the fun of cheering on a randomly-assigned team for a greater or lesser period of time. Good luck to everyone taking part in this, or any other. If I remember, I may even update this post with progress reports as the competition wears on. But please don't hold your breath. 'The Mo', the museum of the North Nofolk fishing town of Sheringham, is currently hosting an exhibition all about fishermen's sweaters, A Shoal of Ganseys. A gansey is a particular type of sweater or jumper, knitted in the round with no sewn seams, most often (but not exclusively) in navy blue, using fine wool at a tight gauge or tension. They were worn by fishermen all down the east coast of the Great Britain, along the whole route of the herring fishing fleet from the Moray Firth in Scotland to Sheringham and Cromer in Norfolk. They were also knitted and worm elsewhere, including inland waterways, the channel islands and the Netherlands. The exhibition is absolutely splendid. It displays 70+ ganseys in amongst the boats and artefacts that form the museum's permanent displays. The overall effect is very attractive to look at and very evocative. Detailed attention has also been paid to each individual knitted item; the knitting nerd can see where and when each comes from, and care is taken to demonstrate the range of different styles and techniques that were and are used, rather than reducing the tradition to one single model that all ganseys are supposed to have followed. There's a handling collection of labelled knitted samples upstairs, so there's a chance to see the knitting up really close (with low lighting levels in some areas of the museum this was particularly welcome!) and to take away detailed inspiration for future projects. The exhibition runs until 10 September 2014. 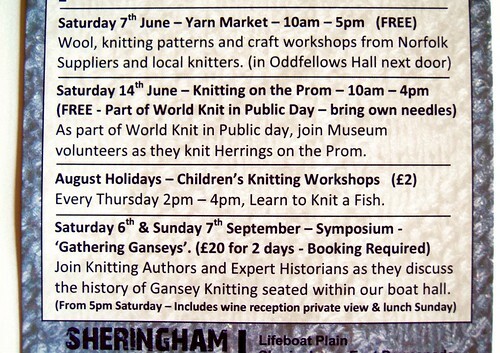 I haven't found details of these online, but the exhibition leaflet advertises knitting on the prom on Saturday 14 June, children's knitting sessions on Thursdays during the summer holidays, and a symposium 'Gathering Ganseys' on Saturday 6 and Sunday 7 September.